Hello everybody. First, I have a quick favor to ask. This blog is now available on Kindle . Right now, the Kindle page for the blog looks a little lonely, so if anyone has time and inclination to write a quick review on the page , I would really appreciate it. As a psychologist, I think a lot about worldview -- the way we see and interpret our surroundings. Worldview is so integral to the way we function that we often don't notice it at all. We take it for granted, and it's only when we meet people who think differently from us that we realize our original biases. Academic psychology is not immune to worldview blindness. Over the years, people have found that psychological principles we originally thought were universal actually hold true only for people from Western industrialized countries. For example, remember the fundamental attribution error? It’s the idea that when someone does something wrong, we blame it on character faults rather than external circumstances. If the new lunch lady is rude to you, we tend to assume that she's a bad person rather than blaming it on a bad day. This principle is taught in psychology courses around the country, but research now suggests that people from other cultures are more likely to take external circumstances into account. Culture even influences things like our vision. For example, look at the picture below. 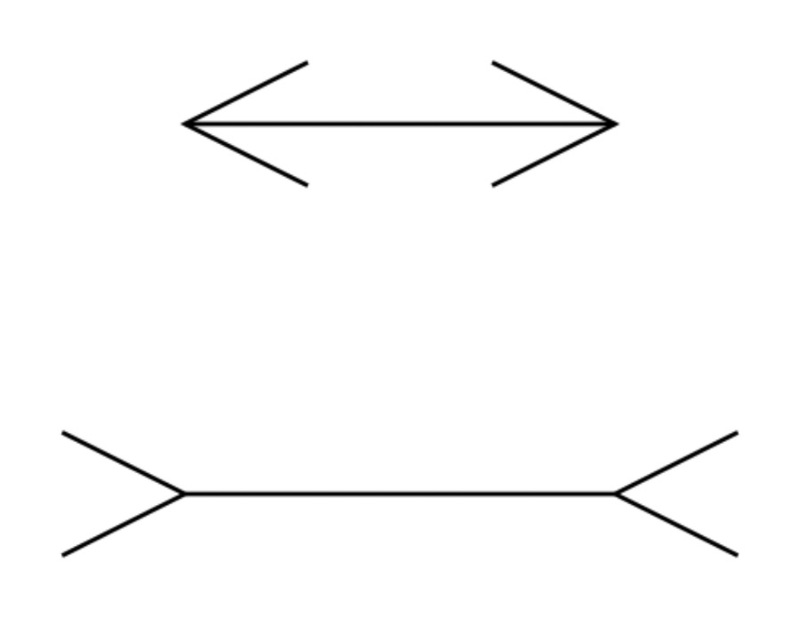 The top horizontal line looks shorter than the bottom one, even though they are the same length. 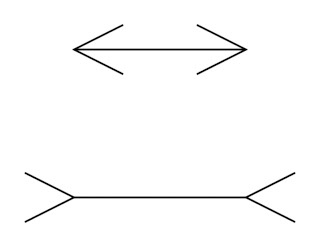 This is the Mueller Lyer illusion, again popular in psychology classes. But it turns out that the power of the illusion varies depending on the culture you grew up in. People from Evanston Illinois are very susceptible to the illusion, while people from traditional societies are less susceptible. So what does all this have to do with Tolkien? It stems from a conversation I had with a friend at World Fantasy Convention. We were talking about how the Lord of the Rings dominates the genre, and how later works attempt to emulate the series. My friend agreed that Lord of the Rings is an influence, if not the major influence in epic fantasy, but she also made an interesting argument – that many Tolkienesque fantasy novels miss Tolkien’s point. What does she mean by that? Hold that thought and take another tangent with me. Long-time blog readers will know that I sometimes reflect on writing rules. Last year, I took Neil Gaiman to task for head hopping. This time, let's talk about rules for plots. How many of you have heard the advice that your main character should play the pivotal role in the progression and resolution of the plot? This is a good heuristic. I'm currently revising my work in progress to make my protagonist play a bigger role in the climax. So what did my friend mean when she said that authors working in the tradition of Tolkien missed the point? She meant that these authors took the scale and structure of epic fantasy but changed it into a more traditional story. In these stories, the main character takes on evil and comes out triumphant. Now I realize I am massively oversimplifying here, and that I'm downplaying Frodo's role and caricaturing writing rules as well as epic fantasy as a genre. My point is not to make overarching generalizations about genre or plot, or to say what kind of story ending is better or worse. But I find it interesting to explore what it is that our society considers to be a “good story.” When we give advice on plotting and structure, are we limiting the stories that we tell and the messages we send? What do you think? P.S. For another interesting article on world view, check out this article at Edittorrent. Edit: There seems to have been some confusion about my title. It's meant to be tongue in cheek. The point was to rethink the writing rule, and what makes good or bad stories. I don't actually think Tolkien or Catholics in general write poorly. Edit 2: Thanks to commenters who have pointed out that Tolkien's message focuses on God's role in defeating evil rather than evil destroying itself. This was my friend's original point, but I had garbled it in the transmission. Apparently, this is laid out more clearly in The Simarillion (Although I have not read it). Top one still looks shorter! Good post, even so! I love thinking about how many attributes of culture we take for granted. Personally, I always thought that authors with particularly exotic backgrounds (and thus, worldviews) might be suited to writing excellent speculative fiction, as they don't have the same cliches as everyone else. Hmm, I was taught those theories as well in my psychology classes. I'm surprised to find out that they're not actually the fundamental law of the human mind that I thought they were. Chuck – the illusion used to work on me, but not so much anymore. I don't know why. Amberdine -- so I gotta ask, how do the lines look to you? I definitely think it's a good idea to have writers with broad ranges of backgrounds. Although sometimes I wonder as a reader how much I can tolerate. I've read some foreign books in translation, and sometimes they're just too different for me to appreciate. I know they're good books because they are bestsellers and well regarded in their culture, but I've been conditioned with what I think a story should be. Shannon -- you weren't the only person surprised. Psychologists were surprised too. I kind of disagree about Frodo and the ring. I think the larger point was that Frodo was responsible for destroying the ring by sparing Gollum's life. In that sense, it was a less straightforward ending, but it was still Frodo's win. Livia, I'm writing for my countrywomen, and anyone who recognizes and hungers for similar experiences. Conversely, I like to read works from other cultures, but honestly, they don't call to me as much as that which I know. I think your friend misses Tolkien's point too. And what's the point of raising issues like this if you're just going to talk about "massively oversimplify" everything? That is not in any way constructive. Also, your title is insulting. "Why Catholics Write Bad Stories"? I think it's pretty clear from Tolkien's popularity and all the imitation that follows him that he was the one writing the good story, not his successors. Keyan - you're totally right that Frodo's decision to spare Gollum's life ended up being a win for Frodo. I think what I was trying to get at was that the destruction of the ring was not a direct result of Frodo's actions, and certainly Frodo didn't know that saving Gollum would destroy the ring. In other words, it's not Frodo coming in and heroically solving all the problems. anyshinything - your observation reminds me how important it is to keep your audience in mind when you're writing. subcreator - The title is tongue-in-cheek. The point is that something might be wrong with the "writing rule" if one of the greatest works of fantasy ever written does not follow it. Yes, to some extent I think the set rules and guidelines to writing do limit the structure and kind of stories that are told. Experimental literature plays with those guidelines, as does some literary fiction, and I find experiments like that very interesting. But the question is how different can fantasy be until it no longer is fantasy, and how different can prose be until it's no longer prose, but moves into the domain of poetry, for example? Oh btw, I have always thought the plot guideline "3 disasters and an ending" for writing, reflects the number of attempts or repetitions the brain can handle until it becomes bored and starts considering giving up. More attempts (or more disasters) and the reader is bored. Less and it feels like one should have tried one more time. I agree with Keyan about Frodo's role but I do see your point that he didn't realise what the outcome would be when he spared Gollum. For me this makes Tolkien's fantasy much more subtle than those of the others who have attempted to follow him. Thanks for a good post on this subject. I agree that people vastly miss Tolkien's point--which was to write a story about God and our experiences, from the Christian point of view. CS Lewis also did this with the Narnia series (although Lewis was not Catholic; this matters not). In fact, Lewis and Tolkien were friends. I always liked to imagine that they set a bet -- who could tell the better story about God through fantasy? :) They didn't do this, but still. I too disagreed with the subject of the post, Livia, so thanks for clarifying in your comment. But to the point of people missing the real message of epics, I don't think this is uncommon. I have missed many messages of novels that went deeper mainly because I didn't have enough exposure to world views, or didn't understand, or couldn't understand. Heck, I still miss points. But, few of these stories have such lasting impact on a genre, either. It seems that if one is going to heavily borrow from a novel in terms of style and world-building and plot, one should make sure one understands where the author was coming from. I think a "good story" is one that is truest to itself, that fulfills its own vision as much as possible. I agree that Frodo fails, but I also agree with the commenters who point out that Frodo's act of mercy helps to save the world. (that plus Samwise) It's a good example of why LotR is such a rich work, with much more depth than subsequent epic fantasy novels. And the people who got offended by your title need to eat a cookie or something. Indeed, Tolkien's Catholic worldview may have been a weak humanity: "Frodo's failure reveals humanity’s inadequacy. In the end, it's evil that destroys itself." However, I have a different interpretation. I always thought Tolkien was taking Matthew 5:30 literally. Either way, it was Frodo's actions and direct intervention that kept Gollum alive earlier in the story so that he could destroy the ring later. So ... I still award Frodo with the lion's share of credit for destroying the ring. I reviewed you on Amazon, and love that you are on my kindle now. Yay! How did you do that btw? I'd love to get my blogs on Kindle and Nook! Oh yeah, Livia, the lines look totally different lengths to me, even at quick glance, even if I'm only seeing *one* of them, I know whether it's the "short" line or the "long" one. Even though I know full well that they're the same length, and I've seen the illusion many times and measured to make sure. I want to second Keyan in disagreeing about Frodo and the Ring. I do not think that the moral of the story is that evil destroys itself. If that were the case, Frodo would not have deserved the accolades he received after the destruction of the Ring. Rather, I think Tolkein is trying to make the point that there is a purpose for everything, and even those things which are decidedly evil are turned to good. Not because evil destroys itself, but rather because God makes it so. Though not explicit in the LOTR, Tolkein does make this explicit in his prequel The Silmarillion. I'm glad people are making the point about "God making it so". That was part of my friend's original argument too, but I didn't put it in because not having read the simarillion myself, I couldn't support that part of the argument. Also, since I go to an Episcopal church, I should be exempt from writing badly, yes?. Yes. I thought so. Great post! As a Christian, I often lament the books that other Christians are publishing, mostly because the characters are too good to believe. That's why I agree that Tolkien does 'bad' very well. CS Lewis too, for that matter. The Narnia children are all heroes, but they all have human fallibility, jealousy, selfishness, etc. Also, in postmodern vernacular, LOTR is true, that is, it shows the true nature of the universe even above issues of worldview. I teach writing, and folk stories written by my students from other cultures often feel raw to me because they don't follow my tradition of story structure. I don't know how to read them. I was also struck by how foreign the Indian epic Bhagavad Gita felt when I first heard it--very circular and unresolved. I wouldn't say that those who write Tolkienesque fantasies miss his point, but rather that we have different points that we wish to make. I created a Tolkienesque fantasy world for the novels that I am writing, yet I wanted a world in which religion did not exist. I have my own various points that I wish to get across in my stories, only I wish to do so within the confines of my favorite type of fantasy setting (learned as much from Dungeons & Dragons as from Tolkien). Great point, Ted. There's definitely more than one way to do epic fantasy. Ultimately audiences are just boogers to deal with; they want two things, every time: something that's the same and something that's different. The urge toward rules is the writer trying to find a way to deliver "the same", and the urge to break them is the writer allowing "the different" to win. (Breaking rules for their own sake doesn't get you to "the different.") This is part of why workshops are such terrible traps for many writers after the beginning stage; they don't discriminate between differences that are just accidents and differences that are the whole reason to write the story. And that's why the Tolklones are so unsatisfying compared to Tolkien himself. Grace that just happens any old way, and a God whose grace is inexplicable, isn't nearly as rule-meeting or as explicable as a six step process for meeting the nine requirements of the Grace merit badge. It's just a better story. And indeed, better stories themselves are more often the product of grace (or the spirit) than of checklists (or the letter). The Lord of the Rings not only isn't a traditional epic story, but it actually contains within it commentary mocking people who would turn the story into a traditional epic fantasy where a demigod (or superhero or action hero) triumphs over evil through might. During the coronation of Aragorn, there are two commoners watching the events, and one of them has been hiding in a rural area and so missed all the action. Naturally, she wants to know what happened and who the players are, and her cousin is very obliging. But when here cousin tells the story, she gets it fundamentally wrong in exactly the same way that people who read Tolkien or try to emmulate him get it fundamentally wrong. In Ioreth's version of the Lord of the Rings, Frodo is a great swordsman hero who defeats Sauron in single combat and throws down his tower. She's incapable of understanding or simply unwilling to accept the true story. O. M. G. I think you just helped me solve my problem with a trilogy I'm creating (first book done, but needs revising, second two massively reenvisioned with the goddess-maiden-crone themes). Seriously. It means a lot of rewriting, but I can see the problem I caused myself, and how to fix it. Thank you. I've never really understood the whole, "he was mean, he is evil" Western societal more. I must have gone wrong in Catholic school, and paid more attention to common sense advice like "walk a mile in someone's shoes before you judge them."